This is the part where I would normally summarize the plot of the book, only in this book I have absolutely no idea what's going on. 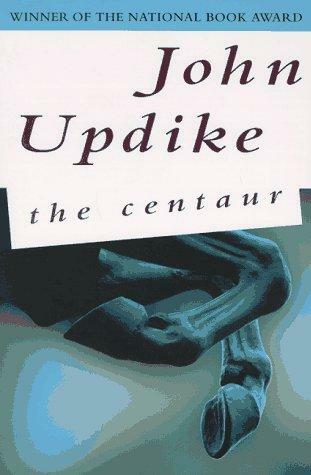 From what I can gather, high school teacher George Caldwell is so unhappy with his life he merges reality and fantasy, imagining that he is Chiron the centaur teaching heroes instead of louts, with a beautiful daughter instead of his sickly son. This is a weird and strange book, from practically the get go. In the first chapter, George arrives late to class to find out that the principal is sitting in on his class. While George lectures, the principal starts to fondle one the girls in the class, removing her bra so that her breasts are visible to all by the end of class. Additionally, a male student starts to caress the neck of a female student in front of him, and the two begin making out before the end of class. I'm sorry, but what? How likely is it that any of this would really happen? Did it even happen, or was it a part of George's fantasies? Peter, George's son, once makes mention that the romance Peter has with his mother doesn't involve George, which icked me out. Though, I don't think there was anything inappropriate going on, it was still icky. Yet another book published with spelling errors. "Barrer" instead of "barrier" is a pretty bad one, considering the first isn't even a word. Lastly, it was odd how the author used the Greek god names for every deity he wrote about, except for Venus. Venus was the Roman goddess of love, Aphrodite was Greek. Weird book. I just couldn't get into it at all.